This is the perfect Sunday morning post because it’s exactly what we are having for lunch today, along with some spicy fish curry. 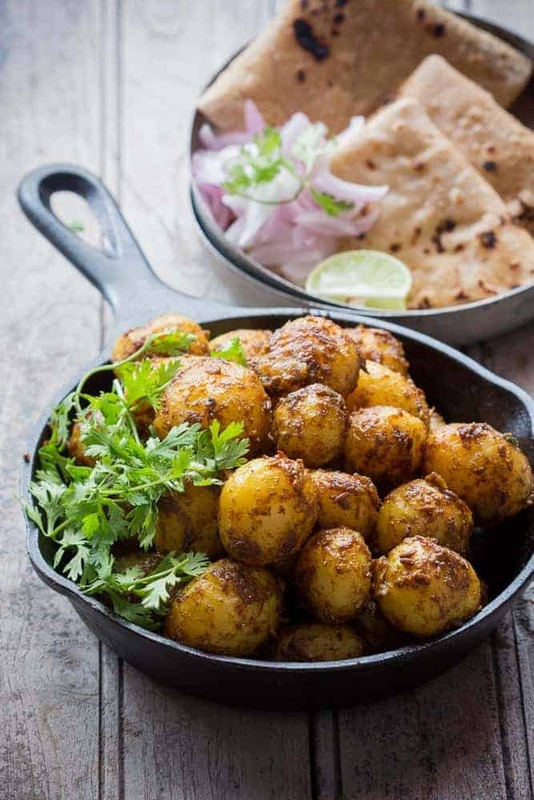 And I’m posting this right in time for you to go to the grocers, buy some potatoes and try these Bombay Potatoes or Chatpate Masala Aloo out. This right here is my FAVORITE way to cook potatoes. Denver is a massive potato fan. It’s his vegetable of choice. The only one he actually likes eating. How many meat lovers agree with me? He’s not a fussy eater, but I can see how excited he gets when there’s potatoes vs. any other vegetable. So when my friend Hina asked me to guest post for her blog, I couldn’t help but put this recipe together. It’s easy, quick, spicy and a really fun way to eat potatoes. When I was writing this recipe, I realised how Indian cooking is not always laborious or complicated. There are tons of under 30 minute recipes that we all seem to forget about. Even makhanis don’t need to take hours. 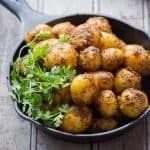 These bombay potatoes fit right under 15 minute meals if your potatoes are already boiled and peeled. If not, just add another 15 minutes to the process. The only drawback is that you might end up eating double your share. Baby potatoes = One bite. So you keep popping them in your mouth one after the other and suddenly they are all gone. Happens. But the advantage? This recipe doubles up as Appetizer as well as Main Course. Add toothpicks to the potatoes and your guests will think that it’s a genius way to serve potatoes. Serve this with dal and chapatis or fish curry and rice, and you have the perfect Sunday lunch. I love how all the masala coats the potatoes. It sorta sticks to the potatoes so that you get loads of spice in every bite. It’s what dreams are made of. Mine and Denver’s. Are you a potato lover? Follow me on Pinterest for more recipe inspirations. Every day. Bombay Potatoes are simply chatpate masala aloo. Coated with spices and ready in under 15 minutes, they double up as appetizer and main course. Heat oil in a pan or kadhai, and add cumin seeds. Once they start spluttering, reduce the heat and add all the spice powders. Sauté for a few seconds and add 2 tablespoons water along with potatoes and salt. Mix well so that the spices coat the potatoes. Cover and cook on low flame for 5 minutes. By this time the water should have evaporated. Sauté the potatoes till they are nicely coated with the spices. 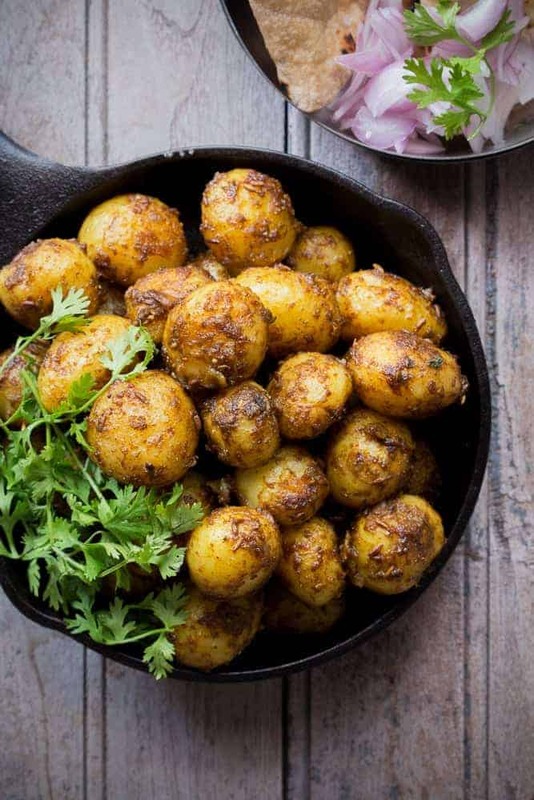 Turn off the heat and top Bombay Potatoes with chopped coriander. I have made this dish according to your recipe a couple of times, and i really love it! So glad you liked it. Thanks Mansi! I am relatively new to Indian cuisine and very new to cooking it. for posting it, and I will be using your recipes often. I’m so happy I was able to make Indian cooking easier for you. Glad both of you enjoyed it!! I was looking for this recipe. First tasted this recipe with poori streets of North India. Its taste was fabulous till then I was looking for it. Found here. Will try today itself. I hope you like it Punam!